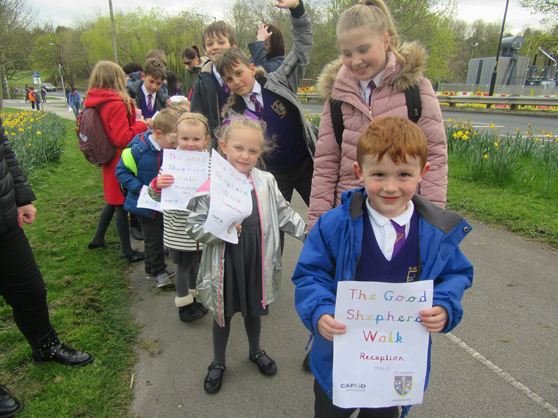 On Friday 5th April, we had our whole school sponsored walk in aid of The Good Shepherd Appeal. We set off from school with our teachers, TA’s and parent helpers, and walked to Killinghall Country Park. The weather was kind to us and spirits were high. The classes all made banners and flags, which was a very cheerful sight for everyone to see. Our current total raised is £336.20, and still counting. Thank you to all our supporters. 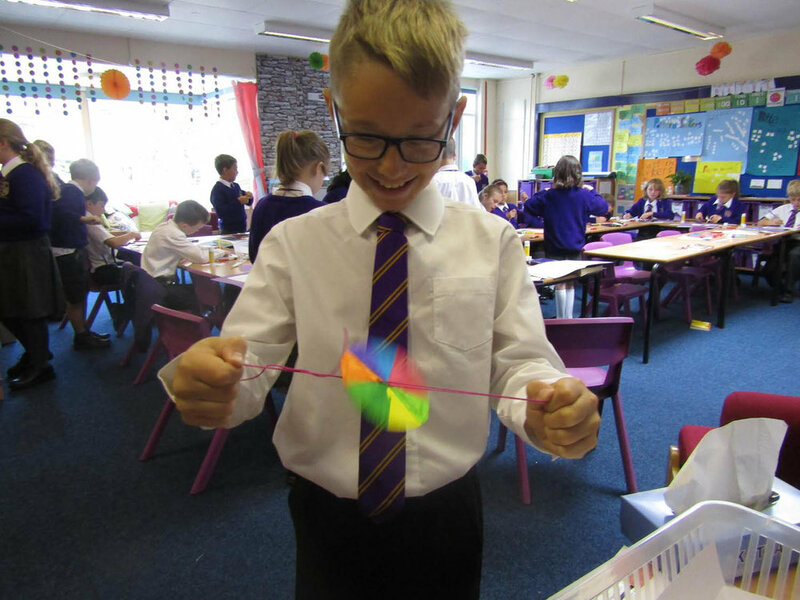 Following on from our exciting STEM week when we had Mr Robinson and Mrs Dillon from St John Fisher’s High School, in school leading the children in some exciting workshops, St Josephs held it’s first whole school science fair on Friday. We had over 70 wonderful projects displayed in the hall, the variation and creativity of ideas was fantastic. The children all did an amazing job sharing their knowledge and enthusiasm for science. Well done everyone! Mini Vinnies hard work pays off. A message from one of our parent helpers. A couple of years ago I volunteered helping Mini Vinnies plant bulbs near Harcourt Road and Walkers Passage. This year they all seem to be flowering. Took a pic to share with the school. On Friday afternoon the Mini Vinnies organised a Lenten Fayre, we asked for donations of toys, books and games. We were overwhelmed by the generosity of our families. The fayre was really busy and we raised £200.30 which will go to our Lenten Charity CAFOD. £126.80 which will go towards our Lenten Appeal for CAFOD. On Friday 14th December we held our Christmas Fair. All the classes planned their stalls and worked hard to create their games and goods to sell. The stalls raised £170.30. The SJSA held their hamper raffle and raised a fantastic £517. They have kindly donated £100 of this along with the stall money to our Advent charity Mission together. We are delighted to say that we have received notification from the Poppy Appeal, with their gratitude for our donation of £264.09. Thank you for your donations. Y6 attended a WWI centenary service at Christ Church along with many other schools in Harrogate. We found out about different aspects of the war through soldiers letters, which we all found very moving. We loved joining in with the war time songs too! In Reception we have read the lovely story by Hilary Robinson and Martin Impey, called “Where The Poppies Now Grow” to help us understand why we have Remembrance Day. We are taught how to stay safe; drugs, alcohol in UKS2 and making the right decision in KS1. All classes could talk about e safety - children spoke of assembly on this topic. All agreed that everyone treats each other with respect e.g. holding doors, listening, being good friends. In Year 6 there are lots of leadership opportunities. All agreed that there is a big variety of clubs to go to and Y6 commented that our sports leader organises lots of fun events. We are a very active school. If we fall over or feel ill, a teacher helps us. We have worry boxes in most classrooms and can talk to teachers if we need to. Is there bullying or unkindness? Not often. We have an anti-bullying assembly and lessons every year and so we know what to do. We learn lots about (developing as good citizens) in our PSE lessons (upper Key Stage 2). We have faith weeks when we learn about other religions. We have a British values assembly each year when we learn about some of these things. We learn a lot through assemblies and collective worship. Our RE lessons also helps us to know how we should behave. Most of the time we all behave well. Everyone wants to do their best and learn a lot in school. Yes, we make sure that we aren’t rude to staff in school. Yes (we understand the consequences of our actions and take responsibility for them), we have warning boards or you may have to fill out a reflection form. Yes (the environment kept well, no litter and if so is it picked up) , we all help keep our classrooms tidy and we recycle too. 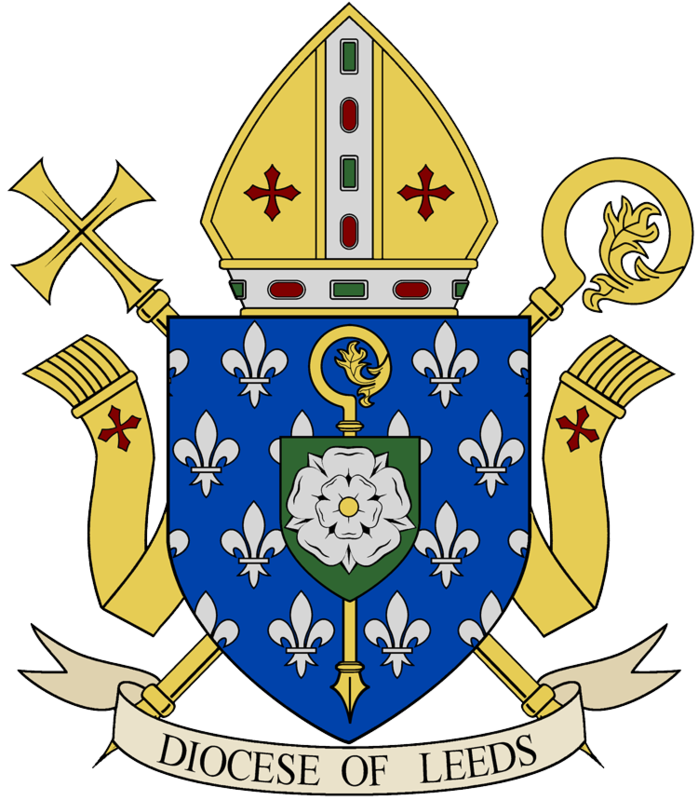 The beginning of term Mass took place at Church on Tuesday 18 September 2018. Our class saint is Saint Therese. She loved flowers and saw herself as the "little flower of Jesus," who gave glory to God by just being her beautiful little self among all the other flowers in God's garden. We painted our own flowers to remind u of her story and to decorate our classroom. St Therese's motto was "to love Jesus and make Jesus loved". We talked about ways that we could show Jesus that we love him and we decorated a shield with our ideas. 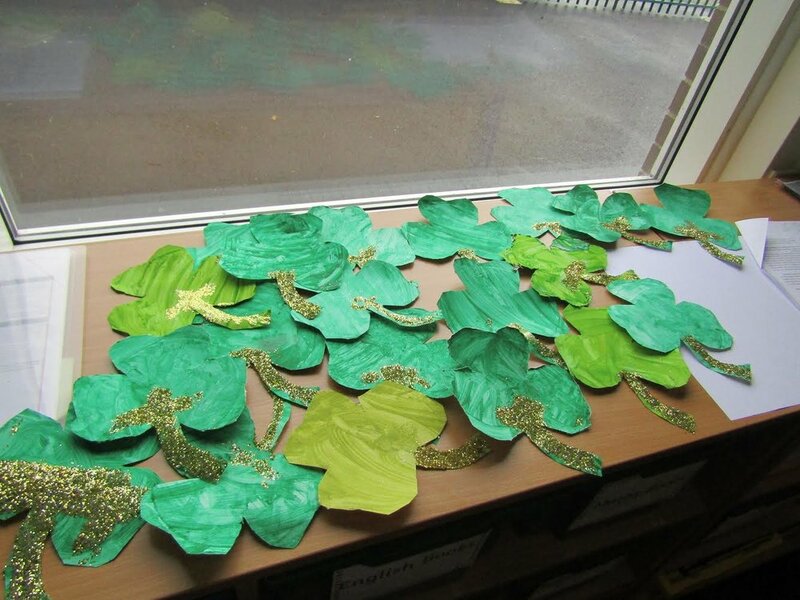 Year 2 have been learning about St Patrick's life. We enjoyed making our own paper plate shamrocks to symbolism the Holy Trinity and St Patrick's teachings. In Year 3 we were learning about S. Peter. We started off by finding out what we already knew about St Peter (a lot) and added it to a spider diagram in our books. We then watched a video and listened to some of the stories about St. Peter and added more information to our diagrams. Then, we split into groups and looked at different Bible verses, before telling the class what we thought they meant, and how they show St. Peter is important to us. We finished by writing a report about what we had learned, then wrote about why St Peter is important to us on some fish so we could make a display. This week we have been drawing portraits of St John Paul (not finished yet!). We have been creating fact files about him and we have been describing his attributes using short films of his life to inspire us. This week we introduced the story of the Children of Fatima. 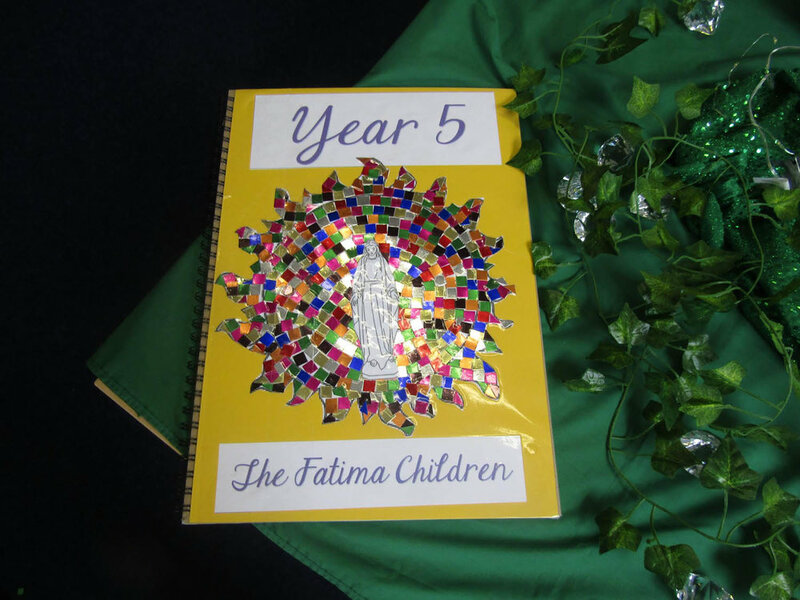 We learned about, 'The Miracle of the Sun' and how Our Lady appeared to three children over six months, encouraging them to pray and make small sacrifices. From this, we were inspired to create a mosaic sun and a spinning sun. We are very pleased with our work. 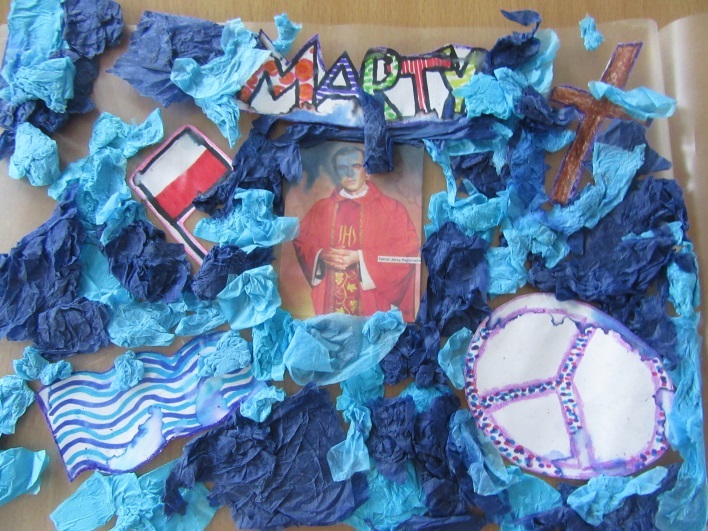 This week in Year 6 have been studying our class saint Jerzy Popieluzsko. We found out all about his story and then created collages representing his life. Later on we linked our learning about Jerzy to pacifism and explored how Catholicism and other denominations of Christianity promote non-violent solutions. From here we worked in groups to create reports linking in everything we had learnt. On the 1st May 2018 the Mini Vinnies went to see the Little Sisters Of The Poor. When we arrived we met some of the Sisters and went into the beautiful chapel and sang some lovely hymns such as: Here I am to Worship, Walk With Me and Amazing Grace. Then we were introduced to some of the kind residents, We all brought some of our school work to show the residents and asked questions about their lives. They gave us lovely food and made sure we were all well. After this we went into the glamorous garden to have a look around. We really enjoyed our time there and we presented them with a cheque for £854.45 following our successful fundraising. We are also very grateful for the two beautiful paintings by Sister Mary Margaret which she gave to us for school! On Tuesday 13th March, the Mini Vinnies had the absolute pleasure of meeting with the SVP (St Vincent de Paul Society) and planting some spring plants that could be taken home. Everyone enjoyed planting the pansies and violas and it was great that we could all work together and enjoy this activity. 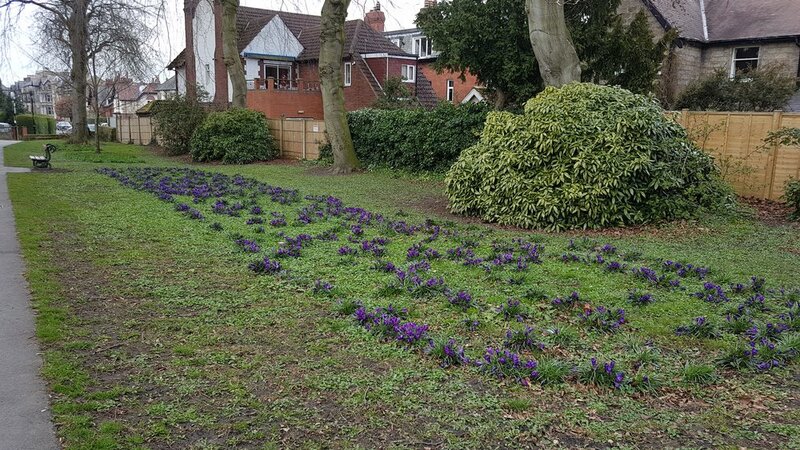 We can’t wait to see what the plants look like as Spring develops and the plants begin to flower. On 29th January, Year 6 led an assembly to honour the memory of Holocaust Memorial Day. We read the touching story of Anne Frank and her family, and got to hear what it was like through the 'Power of Words' in Anne's famous diary. It was very interesting but also upsetting to hear what foul crimes were committed during those dark times. 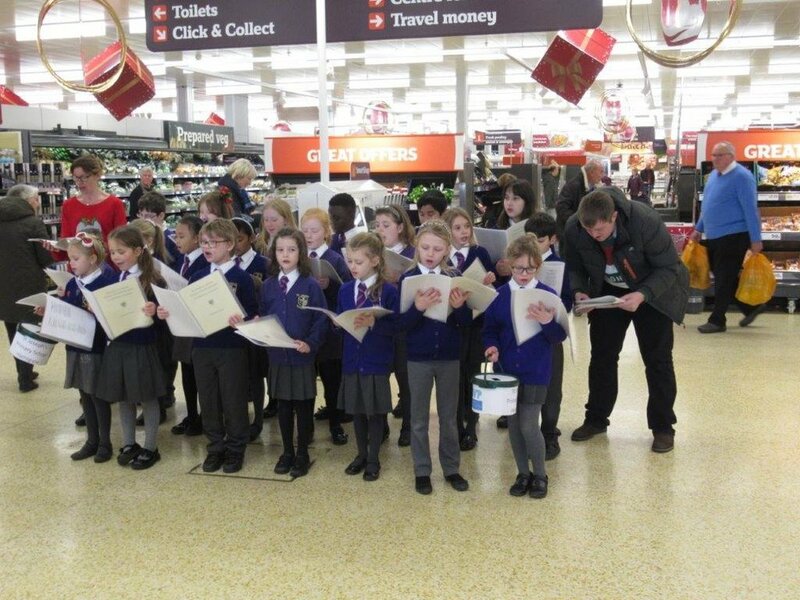 On Monday, our school choir had a very successful visit to the main Sainsbury's store in Harrogate. 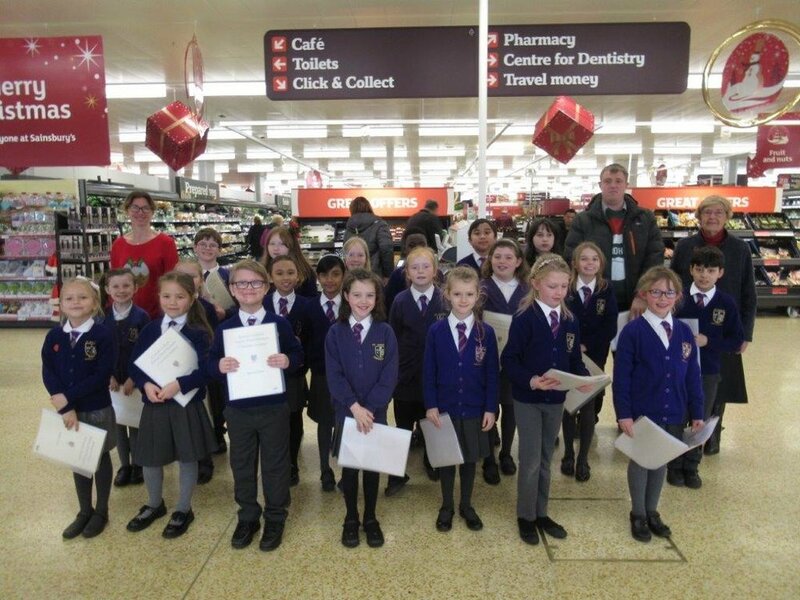 The choir entertained Christmas shoppers with their wonderful carol singing. They were accompanied by Mrs Crowther, Mrs Kent and Mr Thompson. 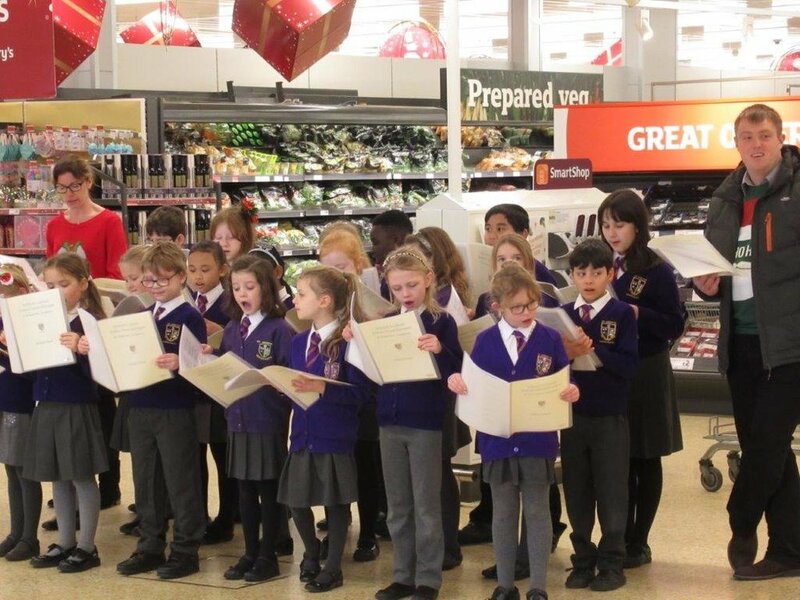 Mrs Crowther said, "The children sang beautifully and were all a credit to the school. It was also a very profitable venture and an amazing amount to be collected from the shoppers!" The children raised a magnificent £185.00 in an hour and a half which is going to our advent charity, St Joseph's SVP society. Well done to our choir!! 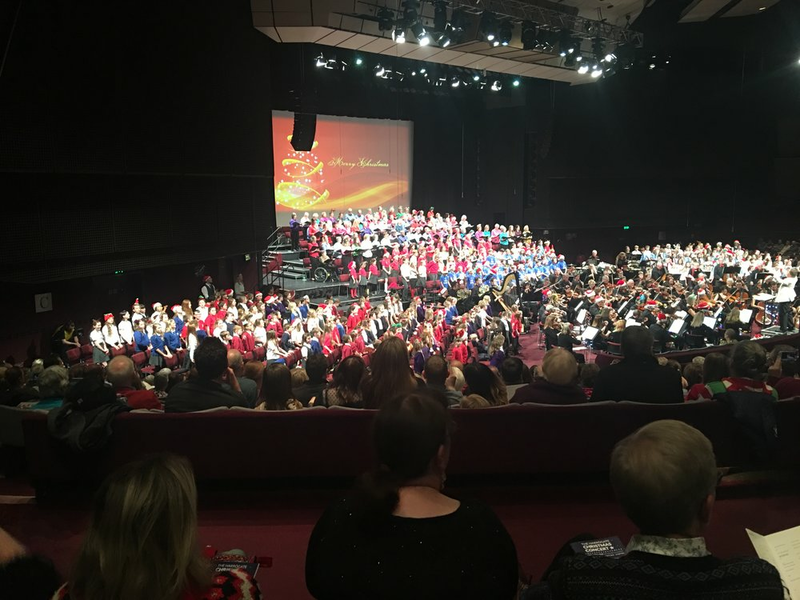 On Saturday 16th December the school choir were fortunate in participating in the Harrogate Christmas Concert at the Harrogate International Centre. 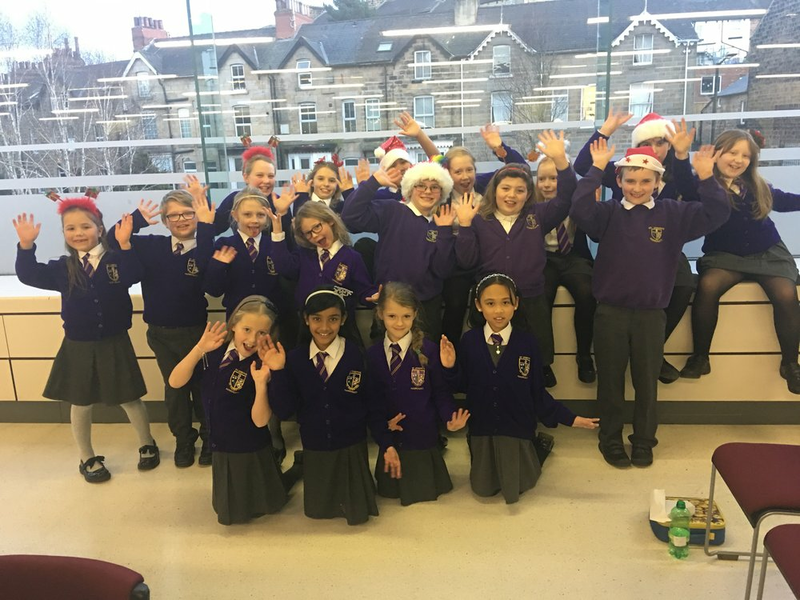 The children sang beautifully and were fantastic ambassadors of our school. Thank you to all of the families who came to support us also!